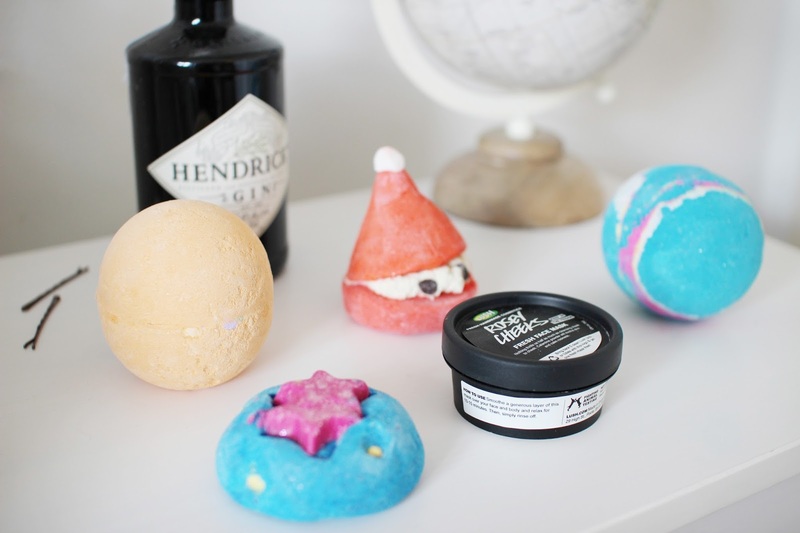 A little while back, I featured a few little treats from Lush’s Christmas collection in my ‘Primark and Lush’ haul. And, now that I’ve tested and tried them all I wanted to write mini reviews on them. Let’s start with ‘Rosy Cheeks’! 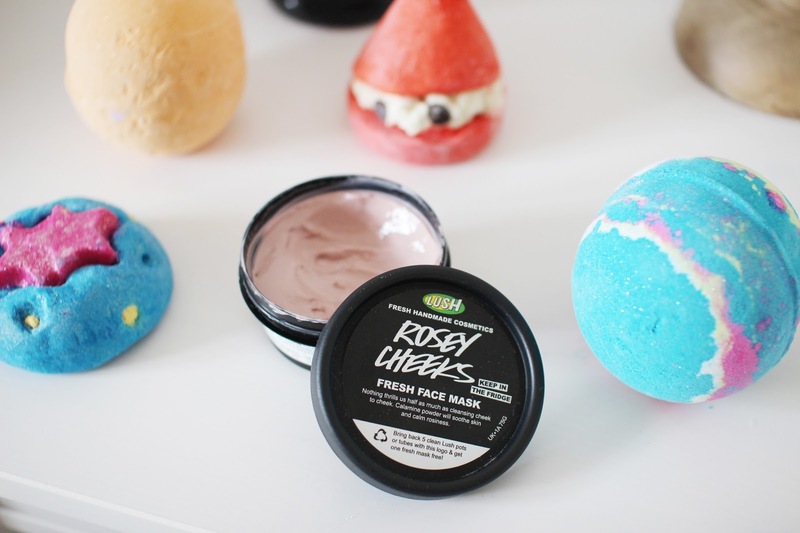 Rosy Cheeks is a fresh facemask, which is exclusive during Christmas time. This little tub claims to calm and soothe rosiness, with the main ingredients being calamine powder and rose oil. I love Lush’s facemasks, and I’m super impressed with this one. 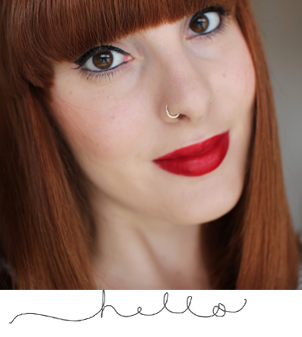 It’s perfect for winter, as your skin tends to get a little bit red and dry with the weather changing. My fiancé Joe is also a big fan of this as it has calmed his skin down massively as he has been suffering with a few breakouts on his forehead. Next up we have the ‘Intergalactic bath bomb’, the appearance of this is gorgeous, with the blues, pinks, whites and glitter. And the smell is really interesting – it’s quite minty and not your typical lush scent. When I popped this into my bath it fizzled away and looked like something from space (hence the name ‘Intergalactic’), it was beautiful! And I would happily purchase this again.Moving on to the ‘Yoga bomb’, a simple yet most relaxing and refreshing bath bomb. Once I dropped it in, it looked like a sun was forming which was really lovely. This scent is quite woody with the likes of sandalwood oil and ho wood oil inside. looks like a macaroon but with whipped cream filled inside. This bubble bar has shea butter, cocoa butter, strawberry sweet bergamot and geranium oils, all super moisturising ingredients that will leave your skin silky soft.And last but not least, ‘Big Bang’ bubble bar. This is so lovely to use, it turns your bath completely bubbly and blue, and it also smells divine. It has avocado butter, grapefruit oil and refreshing lemon myrtle oil. So far, I love them all. 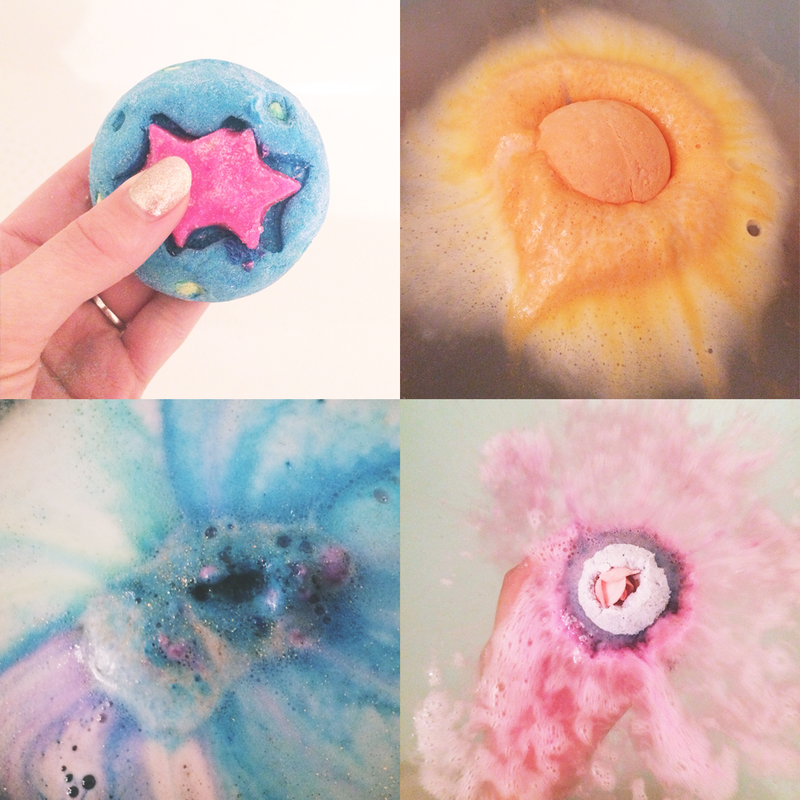 However, my favourite of the bunch has to be the Intergalactic bath bomb! 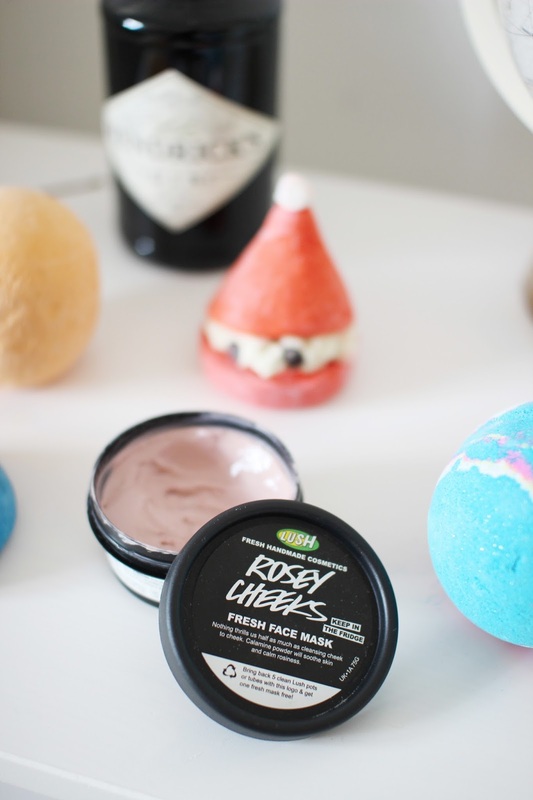 I’m really excited to head back to Lush to treat myself to some more Christmasy bath bombs. Gotta love sparkly indulgent bath’s during winter time!